When the brightness and colour of each star in a globular cluster are plotted on a colour-magnitude diagram, they have the characteristic pattern shown in Figure 1. The shape of this plot is assumed to support the correctness of stellar evolutionary theory. According to theory, the energy emitted by each star is derived almost entirely from thermonuclear fusion.2,3The section of the graph from A to B is called the ‘main sequence’ and each point represents a star that has supposedly been ‘burning’ hydrogen steadily for millions of years, not changing much over all that time. According to theoretical calculations, the more massive the star, the faster it ‘burns’ its fuel. So the points near A are for the smallest and least luminous stars that burn their hydrogen the slowest. The points near B represent the largest and brightest stars that are converting their hydrogen into helium most quickly. Calculations indicate that once a significant portion of the star’s hydrogen has been converted to helium, the temperature and luminosity of the star changes drastically and it becomes larger and redder, and no longer plots on the main sequence.2 The points from B to C are interpreted as such stars. The brightest and reddest stars, called red giants, plot at point C and the line B–C is called the red giant branch.3 Remember that all the stars are assumed to have formed at about the same time. Thus, if stars on the red giant branch are much more evolved, they then must have been much more massive than the stars still on the main sequence. A third sequence of stars, called the horizontal branch, extends from D to E. These stars are interpreted to be the most evolved, having passed through the red giant phase.3 They must have been the most massive of all the stars that originally formed in the globular cluster. This story sounds convincing until we realize that there is no way of testing it. By adding secondary explanations, the story can accommodate any astronomical observation. Indeed, the situation is not as simple as the simple theory claims. For example, most globulars are revolving around the Galaxy in highly eccentric orbits with a period of some 100 million years.5 In 15 billion years, each cluster would have orbited the Galaxy over one hundred times, passing though the Galaxy disk twice each time. This raises the question of how the star clusters could have remained together and compact for all that time. According to theory, they should not be there, but they are. They should have evolved away from the main sequence but for some reason, they are straggling behind, hence the term, blue straggler stars. Although blue stragglers have been known for some 50 years, their study has only blossomed in the last decade with the advent of powerful new hardware and software that can analyze individual stars in the densely packed cluster. So, how are blue straggler stars explained? Remember that the stellar evolution theory involving billions of years is not an issue. The theory has already been accepted as correct. If the basic theory is above challenge then, clearly, the blue stragglers must have either been kept young, are intruders from a different stellar population, or have a different chemical composition that caused them to burn more slowly. According to theory, they should not be there but they are. How long did it take for the 160 or so globular clusters to form? Evolutionists believe it took at least 3 billion years. But from Genesis 1:14–19, 1:31–2:3, and Exodus 20:11 it is clear that they formed in much less than one Earth day during Creation week. This would feature an abrupt formation process for globular clusters. Evidently, no new globular clusters are evolving in the Milky Way, suggesting that the globular cluster formation process has changed significantly since the Milky Way formed or is not operating in our galaxy today. Stellar models based on a 6-Day Creation are very different from those based on billions of years of evolution. Additional variables become relevant once a young universe is assumed. For example, energy supplied by gravitational collapse might be a major source of stellar radiation within a creationist model. Furthermore, issues of design and purpose need to be considered. Creationists do not need to invent special theories to explain the presence of blue stragglers in globular clusters. Blue stragglers could simply be higher mass stars (e.g. spectral class A, main sequence) and indicators of youth. 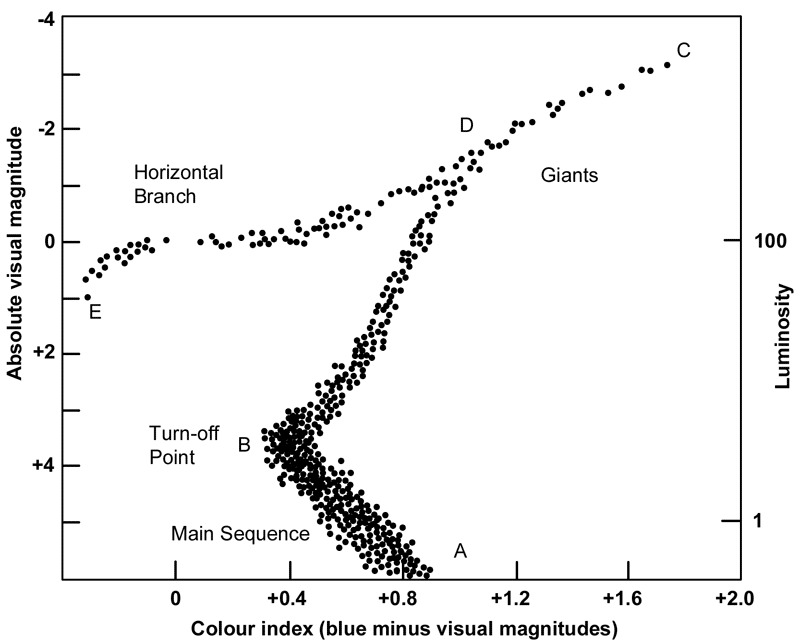 In fact, there is evidence that blue stragglers are indeed higher mass stars. So, how much stellar evolution has taken place in the Galaxy’s globular clusters since their origin? According to stellar evolution theory, at least 13–15 billion years’ worth, beginning with the birth and death of Population III stars before the globular clusters formed.12 However, from a creationist perspective very little change would have occurred in the globular clusters since they were formed rapidly some 6,000 years ago. And since globular clusters have completed much less than one orbit of the Galaxy there has been little dynamical time and change in them since. 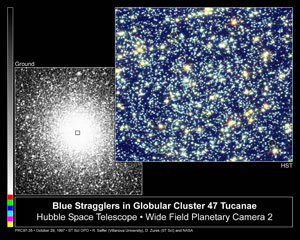 The compact size of globular clusters reflects their abrupt, rapid formation process, and their youthfulness. Astronomy picture of the day: Globular Cluster M5, <antwrp.gsfc.nasa.gov/apod/ap951019.html>, 11 March 2002. Return to text. Abell, G.O., Morrison, D. and Wolff, S.C., Exploration of the Universe, 6th Ed., Saunders College Pubpshing, Philadelphia, p. 483, 1993. Return to text. Abell et al., Ref. 2, pp. 493–494. Return to text. Measuring a Globular Star Cluster’s Distance and Age, The ESA/ESO Astronomy Exercise Series, Exercise 4, <www.astroex.org/english/exercise4/>, 11 March 2002. Return to text. Abell et al., Ref. 2, p. 485. Return to text. Late stellar evolution, <www.oan.es/ciencia/viejas>, 13 March 2002. Return to text. Globular star clusters, <www.seds.org/messier/glob.html>, 11 March 2002. Return to text. How do we measure the size and the age of the Universe, <imagine.gsfc.nasa.gov/docs/science/mysteries_11/age.html>, 11 March 2002. Return to text. Danforth, C., Blue stragglers: a study of stellar longevity, <casa.colorado.edu/~danforth/science/bss/index.html>, 7 March 2002. Return to text. Moche, D.L., Astronomy: A Self-Teaching Guide, John Wiley & Sons, p. 143, 1993. Return to text. NewsNotes, M80’s bounty of blue stragglers, Sky & Telescope, 98(4):18, 1999. Return to text. Bernitt, R., Stellar evolution and the problem of the ‘first’ stars, TJ 16(1):12–14, 2002. Return to text. Abell et al., Ref. 2, p. 493. Return to text. 3 March 2002. Return to text.